﻿Respectful, community-engaged qualitative researcher and educator in social justice and public health. I invite community-based research partners to participate in an anonymous survey on researcher trustworthiness. More information is available in the "work" tab, "Dissertation" drop-down option. Check out my new publication, in JAMA! 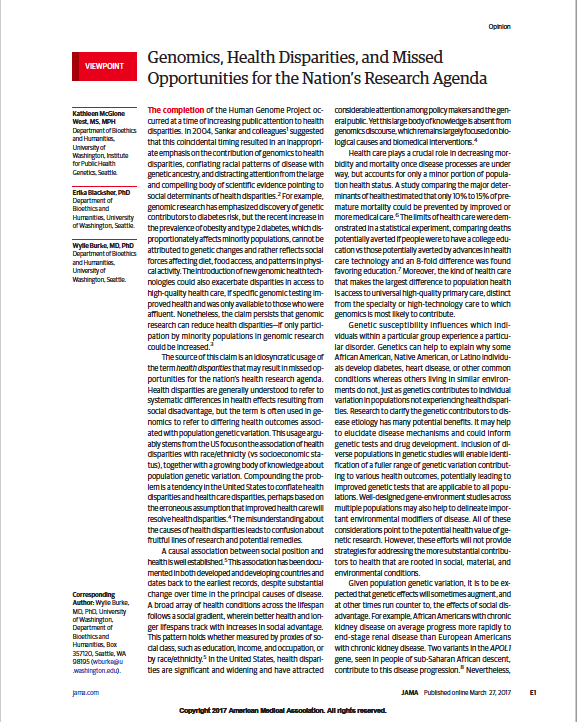 ​We highlight the problems with characterizing health disparities as a problem for genomics research and technology to solve, and argue that the genomics literature uses the term "health disparities" in an idiosyncratic way, that leaves out the overwhelming effects of social determinants of health on health disparities. "The source of this claim is an idiosyncratic usage of the term health disparities that may result in missed opportunities for the nation’s health research agenda. Health disparities are generally understood to refer to systematic differences in health effects resulting from social disadvantage, but the term is often used in genomics to refer to differing health outcomes associated with population genetic variation...The misunderstanding about the causes of health disparities leads to confusion about fruitful lines of research and potential remedies."